Pignon is considered among the best trainers in the world. 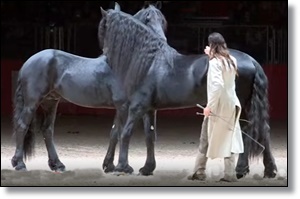 His attentiveness and depth of understanding horses it a top reason that he is so successful with training them to do performances such as this. He understands that there is much more to the horse than regular methods. In an interview with Horse Collaborative, Pignon said, "What I observe most of the time is that people use methods like horses are bicycles. They’re horses. A horse is a big adventure when you start to be with one." He commits himself to learning about the horse and training each individual horse in the way that is most effective.